MOSCOW – Ambiguity has descended on the project to build a high-speed toll highway between St. Petersburg and Moscow through the Khimki Forest – an issue that galvanized Russian and international environmental attention over the summer – as the date for resuming construction of the road, set for February 1, has come and gone with no action. It is unclear whether construction remains at a standstill because of the moratorium placed on construction by Dmitry Medvedev during the summer. But Medvedev announced construction would resume in December. On February 1, Medvedev had much to say about the lessons of the Khimki Forest issue at a meeting of the Presidential Council on the Development Civil Society and Human Rights in Yekatrinburg, but his words failed to clarify whether the forest would be saved or felled. The issue continues to be a flashpoint between the government and environmentalists. 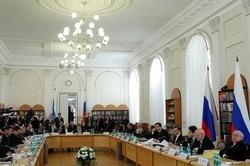 A transcript of the event is available in Russia at Kremlin.ru. It remains only to thank the president for taking the matter in his hands and stopping the clear cutting. His confession that, in the deciding of the route of the highway “the state’s interests were yielded in order to please the commercial interests of certain people,” is much appreciated. Of course, it would be good to know who the villains are –after all, taking government decisions that are not in the interest of the state but commercial interests is corruption. Who, in the former administration under disgraced Mayor Yury Luzhkov, and who in the Ministry of Transport, are the culprits? But the president didn’t name any names. So long as there are no answers to these questions, proponents of building the highway through the forest could continue their corrupt activities to push the highway toward the worst possible route. It is strange that the president tried to review only options including clear cutting – felling here, felling in another place…It’s a shame that he’s not in the loop about other alternatives that don’t have anything to do with cutting down trees and birch life. Anyone who has gone down the existing Leningrad Highway in the Khimki Region knows that the highway is surrounded not by trees but by residential buildings. On almost every stretch of the highway there are auto rest stops, offices, markets and restaurants. Technically, widening the current highway presents no problems. But the restoration of the Moscow region’s oak forests is now hardly possible. The idea of planting five times as many trees than were cut down is only appealing to someone who has never tried to grow a tree. Does Medvedev think that five saplings – twigs – is a fair exchange for one felled century old tree? Mr. Medvedev, drive out to Sheremetevo Airport. Looks from side to side. Take a walk in the Khimki Forest – then will you understand who is in the right in this conflict. Pity that Medvedev could not find time for this on February 3, when a press tour of the Khimki Forest was organized by the Movement in Defence of Khimki Forest. The aim of the tour was to show alternatives to deciding the transport problem and acquaint the public with the results of the independent environmental analysis of the Moscow-St. Petersburg highway project. 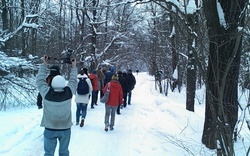 Activists led the participants on a tour along the Leningrad Highway so their own eyes could convince them about how to solve the traffic problem without cutting down the Khimki Forest. According to environmentalists, there are much more effective and cheaper solutions than running the highway through the forest. For example, it would be possible to get rid of the underground electrical lines that run along it. “Here, there are no residential buildings, or stores – nothing,” said Alexander Yaroshenko of Defenders of the Khimki Forest. “According to specialists, it is completely possible to take out the buried electrical lines, and instead continue with gas insulated cables. And on such places, one could build additional lanes to the highway – there is space in abundance,” he said. Greenpeace Russia’s Alexei Yaroshenko refuted the notion that Khimki Forest is practically destroyed. “Only 1.5 percent of the forest has been felled, moreover in its most valuable places,” he said. 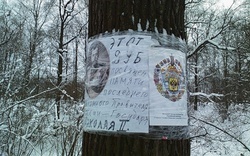 “The Khimki Forest has stood for many centuries. Second in significance only to Losiny Island in the Moscow Agglomeration. The flood plain of the Klyazma River within it has been maintained in an untouched state, which, if the road is built, will be destroyed. Fragmentation of the forest by the highway will lead to its death,” said Yaroshenko. 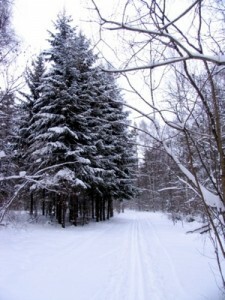 Yaroslav Nikitenko, also of Defenders of the Khimki Forest, told Bellona Web in a February 3 telephone interview that the results of the independent environmental assessment had been released on various segments of the highway, and had been conducted by 15 experts among which were five PhDs and seven doctoral candidates in science. In their assessment they examined 12 alternatives to the road between the 15 to 58 kilometre marks of the Moscow-St. Petersburg highway. “The given assessment shows that the government-chosen option will not only cause maximum damage to the Khimki Forest, factually destroying it as an ecosystem, and without solving the traffic issue. The existing option, relying on the T junction form of the intersections on the Moscow Ring Road, does not have an extension in Moscow. Aside from that, on account of the whimsically convoluted trajectory, the speed characteristics of the highway are slowed, and it turns out to be 10 kilometres longer than if it were straight,” said Nikitenko. 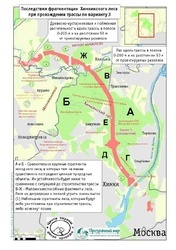 “It would make sense to refuse to realize the project of the toll highway between Moscow and St. Petersburg between the 15 to 58 kilmetre marks in its current state as ecologically harmful and economically unfounded, and as a source of social pressure and a non-solution to traffic difficulties,” read the conclusion that the independent experts came to, which can be read here in Russian. Nikitenko pointed out the more general problem. According to his data, there is a plan afoot in the offices of Moscow Regional Governor Boris Gromov’s office to cut down all forests in the Moscow region to make way for toll roads, apartment buildings, and warehouses as if what now stands near the Vashutino Forest is in the place of Khimki. “This is why it’s so important for us to stand up for Khimki Forest. If we give it away, then all the rest will follow,” said Nikitenko. To return to what Medvedev said: After all, the very task of not allowing the total clear cutting forests around Moscow and other Russian cities is now on the agenda. 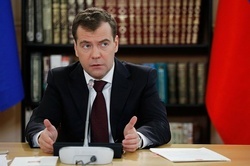 “I think that the hearings that took place helped at minimum with two issues, continued Medvedev. “First, they proved that public opinion can be heard on the level of the president and that the position of the community, the environmental community, can be the foundation even for halting construction work on which money has been spent and which include multimillion (dollar) contracts. Can government bureaucrats realize the simple fact that defenders of nature are frequently right for us and ahead they are needed to lead the camp of protest, to stop construction machines and risk their lives and health? Maybe the state understands that strict observance of environmental law and taking into account public opinion are the very thing that can deter conflict and find optimal solutions. Or are we always doomed to choose between the bad and the worse? The news that the city court of Khimki delayed until the beginning of May the arrest of Andrei Chernishev, a local bureaucrat with the Khimki City administration, broke right after the meeting of the Presidential Council. It is hoped that there will be punishment for the organizers of the attacks on environmentalists, and the organizers of corrupt activities around the building of the highway though the Khimki Forest.